A clinical trial management system (CTMS) is a software solution targeted at the life sciences industry. The global clinical trial management system market was valued at approximately US$ 1.1 Bn in 2016 and is anticipated to expand at a CAGR of approximately 13% from 2017 to 2025 to reach value of approximately US$ 3.2 Bn by 2025. Increasing research and development (R&D) investment in clinical trials and integration of clinical trial management systems with hospital information system (HIS) are likely to fuel the expansion of the global clinical trial management system market from 2017 to 2025. Clinical trial management solution is primarily employed to manage a large amount of data involved in a clinical trial including planning, preparation, and performance and reporting. The system emphasizes keeping up-to-date contact information of participants and tracking deadlines for interim reports and regulatory approvals. In some cases, CTMS may also provide data to a business intelligence system, which acts as a digital dashboard for trial managers. It provides a user-friendly infrastructure that enables clinicians to manage trials of varying complexity. However, lack of awareness, longer approval time of clinical trials, and strict regulations to enroll patients for clinical trials restrict the expansion of the market. Unmet needs of consumers in the global clinical trial management system market create significant opportunities for existing players and new entrants in the global market. Cloud-based clinical trial management systems provide ample opportunities for players operating in the global clinical trials management system market. Some recent developments in clinical trial management system market are introduction of clinical trial transparency tracker system by MMS Holdings Inc., clinical trial data capture and security system by Icon Clinical Research Limited, and clinical trial unified platform for stakeholders by eClinicalHealth Limited. In addition to recent developments, the global clinical trial management system market has witnessed some significant M&A activities such as acquisition of Parexel International Corporation by Pamplona Capital Management LLC in November 2017, acquisition of Biocinica by international private equity firm- Cinven in August 2016, and acquisition of Merge Healthcare and its clinical trial management system business segment by International Business Machines Corporations in October 2015. The global clinical trial management system market can be segmented based on mode of delivery, component, type, end-user, and geography. Based on mode of delivery, the cloud-based clinical trial management system segment is projected to show the highest expansion over the forecast period, followed by the web-based segment and on-premise segment. Increasing demand and high spending on cloud technology are likely to propel expansion of the segment. In terms of component, software was the leading revenue generating segment in 2016, and it is likely to continue its dominance during the forecast period, owing to high sales of software products, low cost of installations, and easy customizations. Based on type, the enterprise-based segment held a prominent market share in 2016 and is anticipated to expand at a significant CAGR during the forecast period, owing to rising interest in application-based enterprise solutions. In terms of end-user, pharmaceutical industries was the leading end-user segment in 2016. The contract research organizations (CROs) segment is likely to expand at a rapid pace during the forecast period due to the emergence of CROs in Asia and Eastern European regions. Based on geography, North America accounted for a significant share of global clinical trial management system market in 2016, owing to availability of clinical trial management system products, presence of leading product vendors, and significant number of performed clinical trial studies. The market in Asia is projected to gain market share during the forecast period and is likely to be key a revenue generator in the coming years. 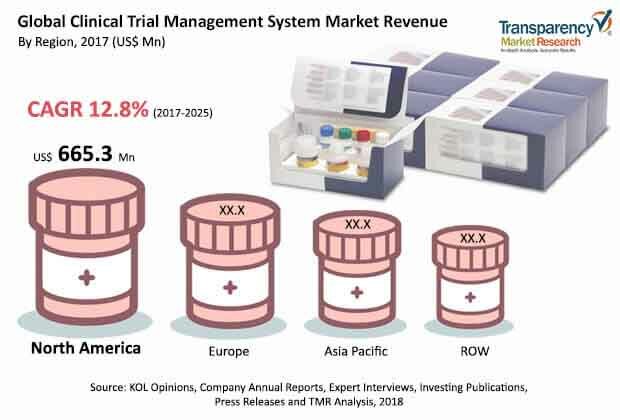 The clinical trial management system market in Asia is anticipated to expand at a rapid CAGR over the forecast period, owing to high expenditure of cloud technology and emergence of contract research organizations in Japan, South Korea, and China. Key companies operating in the global clinical trial management system and profiled in the report include Oracle, Medidata, and Parexel International Corporation (now part of Pamplona Capital Management LLC). These players are adopting organic and in-organic growth strategies to expand their product offerings, strengthen their geographical reach, increase customer base, and garner market share. Other players operating in this market are International Business Machines Corporation, Cinven, MedNet Solutions, Inc., Microsoft, Apple Inc., Wipro Limited, Bio-Optronics Inc., Cognizant Technology Solutions Corporations, DSG, Inc., Forte Research Systems, Inc., Veeva Systems, DATATRAK Int etc. A clinical trial management system (CTMS) is a software solution targeted at the life sciences industry. Clinical trial management solution is primarily employed to manage a large amount of data involved in a clinical trial including planning, preparation, and performance and reporting. The system emphasizes keeping up-to-date contact information of participants and tracking deadlines for interim reports and regulatory approvals. In some cases, CTMS may also provide data to a business intelligence system, which acts as a digital dashboard for trial managers. It provides a user-friendly infrastructure that enables clinicians to manage trials of varying complexity. However, lack of awareness, longer approval time of clinical trials, and strict regulations to enroll patients for clinical trials restrict the expansion of the market. The global clinical trial management system report comprises an elaborate executive summary, which includes a market snapshot that provides information about various segments of the market. It also provides information and data analysis of the global market with respect to the segments based on mode of delivery, component, type, end-user, and geography. A detailed qualitative analysis of drivers and restraints of the market and opportunities has been provided in the market overview section. In addition, the section comprises competitive matrix and company profiles with business overview to understand the competitive landscape in the market. This section of the report also provides market attractiveness analysis, by geography and market share analysis by key players, thus presenting a thorough analysis of the overall competitive scenario in the global clinical trial management system market. Based on mode of delivery the global clinical trials management system market can be segmented into on-premise, web-based, and cloud-based. In terms of component, the global clinical trials management system market can be classified into software, hardware, and services. In addition, the global clinical trials management system market has been classified into enterprise-based, site-based clinical trial management system. Furthermore, the global clinical trial management system has been categorized into pharmaceutical industries, contract research organizations and healthcare providers. The global clinical trial management system market has been analyzed based on number of clinical trials performed, technology trend, expenditure on emergent technology, and presence of key players in the region. The market size and forecast for each of these segments have been provided for the period from 2015 to 2025, along with their respective CAGRs for the forecast period from 2017 to 2025, considering 2016 as the base year. In terms of geography, the global clinical trials management system market can be categorized into North America (the U.S., Canada), Europe (the U.K., Germany, France, Russia, Poland, and Rest of Europe), Asia (China, India, South Korea, Taiwan, and Rest of Asia), and Rest of the World. The market size and forecast for each of these regions and the mentioned countries have been provided for the period from 2015 to 2025, along with their respective CAGRs for the forecast period from 2017 to 2025, considering 2016 as the base year. The research study also covers the competitive scenario in these regions. The report also profiles major players in the market and provides various attributes such as company overview, financial overview, product portfolio, business strategies, and recent developments. Major companies profiled in the clinical trials management system are Oracle, Medidata, and Parexel International Corporation (now part of Pamplona Capital Management LLC), International Business Machines Corporation, Cinven, MedNet Solutions, Inc., Microsoft, Apple Inc., Wipro Limited, Bio-Optronics Inc., Cognizant Technology Solutions Corporations, DSG, Inc., Forte Research Systems, Inc., Veeva Systems, DATATRAK Int, and others.